The Union Minister for Human Resource Development, Smt. 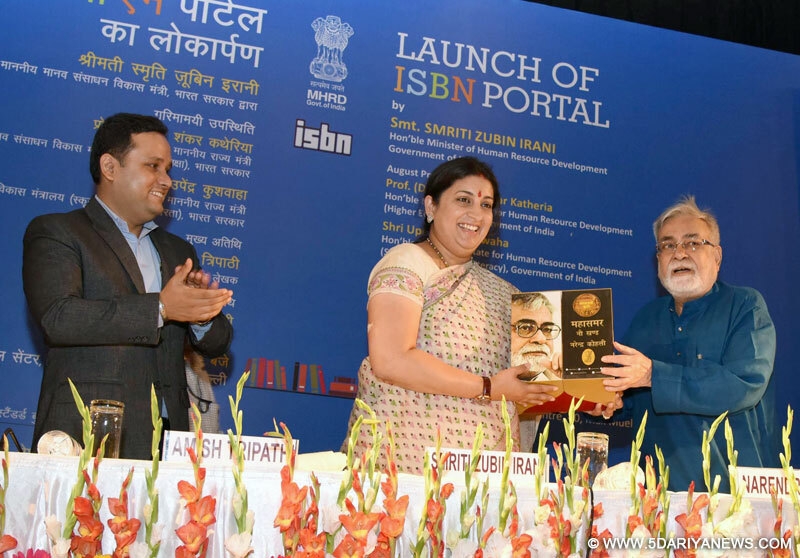 Smriti Irani at the launch of the ISBN Portal, in New Delhi on April 07, 2016. Union Human Resource Development Minster Smriti Irani on Thursday launched a portal for registration and allotment of International Standard Book Number (ISBN). "The portal has been created to facilitate publishers and authors to register for ISBN number. ISBN gives an identity to a book. If you do not have it, the bookshops will not sell it," the minister said launching the portal and mobile app which will also provide information about authors and publishers. "ISBN has become an important part of publishing sector now. This online system is an excellent initiative towards providing enhanced accessibility to the publishers and authors," Irani said. She said that after getting feedback from publishers, a mobile app in regional languages would also be launched to reach out to more publishers and authors across the country. "Publishers and authors from small towns will be the most benefited ones from this initiative," Irani said.To address the problem of free download of works of authors from the internet, Irani assured the book writing fraternity that the issue will be discussed with the concerned ministries and shared with the states. The ISBN portal is a part of central government's e-governance initiative for streamlining the process of registration for publishers and authors which will make the process user friendly.ISBN is a unique number used to identify monographic publications. Displayed in barcode format, ISBN is a 13-character identification allotted by the International ISBN Agency based in Britain through the National ISBN Agency. It provides access to bibliographic data bases used by the book industry and libraries to provide information. The ISBN portal seeks to completely automate the process of seeking application, their examination and allotment of ISBNs. The developed software has several modules including users' registration and online application submission. The automation process also seeks to maintain inventory as well as process the data that will be provided by the users. There will be doing away with receipt of hard copy of any document unless considered appropriate for establishing the identity of the applicant and for confirming the book publishing activity.Taking forward the government's ambitious Digital India campaign, the HRD ministry's endeavour will ensure ease of registration, enhanced accessibility, wider transparency, trust and credibility and greater efficiency for the book writing fraternity in the country.